the All Star break is upon us, and that means it's time to calculate Michael's 1st half numbers of 2015. usually i do a short version of this blog, but this year i decided i would provide all the details using the new format i recently implemented with the split sections. feel free to scroll through everything to find what most interests you, or skim through each section and focus mainly on the bold/italicized parts. so far in 2015, Michael has a total of 346 plate appearances and 305 at bats in 79 games (617.0 innings). in total, he has 89 hits, 29 extra base hits, 60 singles, 24 doubles, 5 home runs, 46 RBI, 4 sac flies, 35 runs, 37 walks, 5 intentional walks, 9 stolen bases (2nd), 1 caught stealing (3rd), 8 GIDP, 26 strikeouts (16 swinging, 10 looking), 20 first at bat hits, 128 total bases, 129 left on base, 126 putouts, 7 assists, 1 error, and 1 double play. Michael's .292 batting average is currently the 2nd highest on the team out of all the qualifying players. Jason Kipnis is still ahead of him with a .323 batting average. when comparing Michael's BA to past seasons at the All Star break, this is pretty good, if you forget about 2014 when he topped out at .322. he was batting .279 in 2013 and .288 in 2012. so 2015 is an upgrade from those years, which is rather exceptional when you take into account the fact that Michael was healthy in the first halves of both 2012 and 2013.
what a difference 12 days can make. Michael went into July with a .300 batting average and now at the break he's down to .292. blame it on interleague play or the back strain, but it was not the greatest way to finish the first half of the season. overall, Michael's first half has been inconsistent. some nights he looked like the All Star he was last season, and other nights it appeared as though his lower back strain was very present and negatively impacting his abilities. it hurt his running game, his defense, and even his smooth swing at times. one consequence of Michael's mostly conventional play so far is that he's not going to be in Cincinnati for the All Star game this year, but that might be a blessing in disguise. these 4 days off could be a big help for the back strain he's been playing with since spring training, so this is probably for the best. i'm confident in my presumption that Michael's numbers would be better and he'd be more like his usual, consistent self if not for this injury. for example, at the halfway point in a season, Michael normally already has at least 90 hits, 1 triple, 10 stolen bases, 323 at bats, 714 innings in the field, and 143 putouts. he's certainly underperformed this year as a result of his back issues and the 9 games he had to miss because of them. my biggest issue with Michael's game right now is when he comes to bat with 2 outs in an inning, either with or without runners in scoring position. for some reason, Michael has almost become an automatic inning-ender this season, which makes me sad. maybe it's a mental thing, idk, but i hope he can do better in these situations after the break. i'm also gonna need the guys batting behind Michael to step things up a notch when he's on base. between hits, walks, reaching on fielder's choices, and reaching on errors, Michael has gotten on base 129 total times in the first half. yet he only has 35 runs scored. that is not good. take away his 5 home runs and the Indians players have only driven him home 30 times. oh my that's a terrible ratio. while there's definitely room for improvement in some areas in the second half, Michael's pre-All Star break numbers for 2015 aren't all bad. he continues to rank high on the team in several categories and put together some impressive streaks this year, as you are about to see. in the first half, Michael leads the team with 46 RBI (tied), 5 intentional walks, and a 9:1 stolen base:caught stealing ratio. he also has the least amount of strikeouts among qualifying players with 26.
he leads the outfielders with 7 assists and 617.0 innings. he's 2nd with 71 games, 126 putouts, and 1 double play. Michael is 2nd on the team with 89 hits, 24 doubles, 4 sac flies, 9 stolen bases, 128 total bases, 305 at bats, .292 batting average, .364 OBP, and .784 OPS. additionally, he's 3rd with 29 extra base hits, 35 runs, 37 walks, 346 plate appearances, and .420 SLG. after comparing his numbers to past seasons, i found that Michael set career highs for himself in the first half with 37 walks and 5 intentional walks. he has a career low 26 strikeouts at this point as well. these rankings around the league only include those categories where Michael is in the top 10.
among qualifying players in the American League, Michael's ranked 4th in doubles (24). and for the record, he's down to 20th with his current .292 batting average. Detroit's Miguel Cabrera leads the AL with his BA of .350.
among qualifying outfielders in the American League, Michael is 2nd in doubles, tied for 3rd in sac flies (4) and intentional walks (5), 5th in walks (37), 7th in batting average, 8th in OBP (.364), 9th in hits (89), and tied for 9th in RBI (46). among (6) qualifying left fielders in the American League, Michael ranks 2nd in doubles, walks, and intentional walks; tied for 2nd in RBI and sac flies; 3rd in hits, extra base hits (29), batting average, and OBP; tied for 3rd in stolen bases (9); 4th in total bases (128), at bats (305), plate appearances (346), and games (79); and 5th in runs (35), SLG (.420), and OPS (.784). among all major league left fielders, Michael is 2nd in doubles; tied for 2nd in sac flies and walks; tied for 3rd in extra base hits and intentional walks; 4th in hits and OBP; tied for 4th in RBI; 5th in batting average; 6th in total bases, plate appearances, and OPS; 7th in at bats; tied for 7th in stolen bases; 8th in SLG; tied for 9th in runs; and 10th in games. among all major league outfielders, Michael ranks 2nd in doubles, tied for 4th in sac flies, and tied for 6th in intentional walks. Michael hit one home run in July (so far) and it's obvious his back has stifled his power this year. he only has 5 homers in this first half of the season. Brandon Moss is still the team leader with 14 bombs, Carlos Santana is 2nd with 10 homers, Jason Kipnis is 3rd with 6, and Roberto Perez and David Murphy are 4th along with Michael with 5.
the HR:RBI ratio for the first half is as follows: 3 of Michael's 46 RBI so far (6.5%) have come from his solo homers, while 7 of his 46 RBI (15.2%) have come from all 5 of his home runs. Michael's K rate at the break in 2015 is 7.5% (26 K/346 PA). he remains the toughest hitter in the American League to strike out and 3rd toughest overall in the majors. he currently averages 1 strikeout for every 13.3 plate appearances. most of Michael's outs keep coming by way of making contact with the ball. presently, he has 113 groundouts, 89 flyouts, and 31 lineouts. Michael had a hit in 61 of the 79 games he's played thus far in 2015 and reached base safely in 68 games. he has 18 hitless games, but still reached base in 7 of those. Michael has 21 multi-hit games, 6 3+ hit games, and 7 multi-RBI games. he has at least 1 RBI in 39 games. in addition, he has 11 go-ahead hits and 13 go-ahead RBI. the Indians are now 38-41 in games that Michael played in and 4-5 in the games he sat out. --a 5-game RBI streak from April 30 - May 5, tying a career high. --an 11-game hitting streak, longest on the team at that time, from April 30 - May 12 (over 13 days). --an 11-game on-base streak between April 30 - May 12. --a 15-game on-base streak on the road from April 17 - May 17. --a 19 consecutive stolen base streak from July 19, 2014 - May 24, 2015. --another 11-game hitting streak, still longest on the team at that time, from May 30 - June 13 (over 15 days). --an 11-game on-base streak between May 30 - June 13. --a 202 consecutive errorless games in the outfield streak from April 4, 2014 - June 28, 2015. --an 8-game hitting streak from June 24 - July 2. --an 8-game hitting streak on the road from June 16 - July 2. --a 9-game on-base streak from June 24 - July 3. --a 9-game on-base streak on the road from June 16 - July 3.
at the break, Michael is batting .289 (50-for-173) against right-handed pitchers and .295 (39-for-132) against left-handed pitchers. these BAs are quite similar, something i've come to expect from Michael, although i am a little surprised he continues to perform better against the southpaws--to this point at least. Michael's currently hitting .291 (43-for-148) with 21 RBI at home. he has 13 doubles and 4 home runs (17 extra base hits) at Progressive Field, along with 19 runs, 19 walks (2 intentional), 5 stolen bases, 3 GIDP, 13 strikeouts (7 swinging, 6 looking), and 68 total bases while playing 39 out of 45 total home games. he hit safely in 29 of the 39 home games he's played in and safely got on base in 33 of them. he has 10 hitless games at home, reaching base in 4.
on the road, Michael's hitting .293 (46-for-157) with 25 RBI away from Progressive Field. he has 11 doubles and 1 home run (12 extra base hits) on the road, along with 16 runs, 18 walks (3 intentional), 4 stolen bases, 1 caught stealing, 5 GIDP, 13 strikeouts (9 swinging, 4 looking), and 60 total bases while playing 40 of 43 total road games. he also hit safely in 32 of 40 road games he's played and got on base safely in 35 of them. he has 8 hitless games away from home, reaching base in 3. Michael's now batting .358 (29-for-81) with runners in scoring position with 38 RBI through the first half. categorically, he's hitting .400 (6-for-15) with RISP and 0 outs, .484 (15-for-31) with RISP and 1 out, and .229 (8-for-35) with RISP and 2 outs. those were all increases from the end of June. however, i am still not happy with the 2 out stats. with 2 outs in an inning, Michael is only batting .248 (29-for-117). he has 5 doubles, 1 home run, 12 RBI, 17 walks, and 13 strikeouts (8 swinging, 5 looking). he keeps trending downward here. i desperately need to see improvement in these circumstances in the second half. additionally, he's batting .340 (48-for-141) with 43 RBI with runners on base and .222 (2-for-9) with 5 RBI with bases loaded at the break. if he comes to bat with the bases loaded in the last 2 and a half months of the season, more production would be welcome. finally, Michael's hitting .250 (41-for-164) with the bases empty. he now has 12 doubles, 3 home runs, and 14 walks when batting with nobody on base. vs. the Detroit Tigers, Michael's now batting .366 (15-for-41) in 10 games. (he missed 2 games because he was out resting his back.) of his 15 hits, 5 are extra base hits--all doubles--giving him 20 total bases. he also has 5 RBI, 5 runs, 2 walks (1 intentional), 1 stolen base, and 3 first at bat hits. in addition, he now has 1 GIDP, 3 strikeouts (2 looking, 1 swinging), and 15 men left on base. defensively, he has 12 putouts in 84 total innings--58 innings in 7 games in left field and 26 innings in 3 games in center. vs. the Chicago White Sox, Michael's only batting .222 (6-for-27) in 7 games. (he missed 2 games because of his back.) he has 2 doubles, 6 RBI, 1 sac fly, 1 run, 2 walks, and 8 total bases. he's struck out 4 times (3 swinging, 1 looking), has 1 GIDP, and left 13 guys on base. in 54.0 innings between left and center field, he's recorded 11 putouts. (he was the DH for 1 game.) he needs to improve against this team's pitching. i already wrote a blog saying how Michael did not make this year's American League All Star team as a starter or reserve, but i will do a quick recap of those results here. 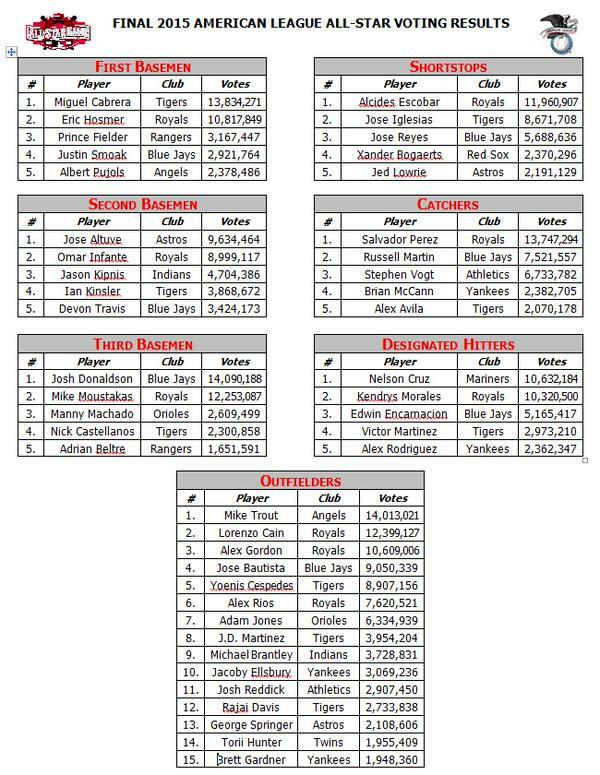 the ballots closed at 11:59 pm EST on July 2, and the results of the AL All Star voting came out on July 5, by which point Michael had fallen back down to where he originally started in 9th place. (he was in 8th place on June 29.) he ended up with 3,728,831 votes, gaining only 517,088 in the final 4 days of voting. 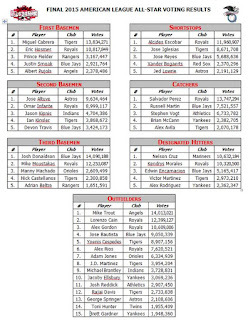 he finished 6,880,175 votes behind 3rd starter, Kansas City's Alex Gordon. no, i suppose Michael's numbers aren't very All Star-like this year but, as i've harped on numerous times already, that is because he's played hurt all season. still, Tribe fans should have wanted to see their team represented well at the Midsummer Classic and voted for him. i myself voted for Michael with 103 different email addresses, and if i'd had more time, i would have voted more. too bad other Tribe fans didn't. defensively, Michael has a combined 126 putouts in both left and center field at the All Star break. he also has 7 outfield assists, 1 error, 1 double play, and a .993 fielding percentage. as the left fielder, Michael has 94 putouts, 6 assists, 1 error, 1 double play, and a .990 fielding percentage. as the center fielder, he has 32 putouts, 1 assist, and a perfect 1.000 fielding percentage thus far. Michael played 202 consecutive games in the outfield without an error, from April 4, 2014 to the 1st game of the doubleheader on June 28, 2015, until the fielding error he committed on June 29. that error occurred while he was the left fielder, giving him 310 consecutive games in left field without committing an error. in the first half, Michael's 6 assists in left field rank 2nd among all AL left fielders. only Detroit's Yoenis Cespedes is ahead of him with 8 assists, but he has 5 total errors compared to Michael's 1. Michael's 1 double play is ranked 4th along with 6 other AL left fielders right now as well. he is also currently 2nd with his .990 fielding percentage. among all MLB left fielders, Michael's 6 assists rank tied for 3rd with San Diego Padres' Justin Upton and LA Dodgers' Scott Van Slyke. Chris Coghlan of the Chicago Cubs is 2nd with 7 assists. among all AL outfielders, Michael's 7 total assists rank tied for 9th with Chicago White Sox's Adam Eaton. among all MLB outfielders, Michael's 7 assists rank tied for 11th with Coghlan and Eaton. now let's break down the numbers. i am going to document his 2015 1st Half #s, the 3rd spot #s, and the DH #s, as well as the left field #s, the center field #s, and overall outfield #s.
Michael played in 79 (of 88) games, 72 complete, before the All Star break. he started and played left in 52 games, completing 42 of those games, appearing in 59 total. he was subbed out of 6 games after 43 innings; 2 games after 14 innings (7 innings/7 innings per game) because the Indians were losing by a lot, and 4 games after 29 innings (7 innings/8 innings/8 innings/6 innings per game) because the Indians were winning a blowout and he had done more than enough in the game. he started and played center in 19 games, completing 11 of those games, appearing in 23 total. he was subbed out of 1 game after 6 innings because the Indians were getting blown out. he was part of a defensive switch in 11 games, moving from center to left in 7 games and moving from left to center in 4 games. 1 inning with no official at bats in 1 game. he started and was the DH for 8 games. he missed 6 games because of his lower back strain. he got 3 games off to rest his back. Michael bat 3rd in 79 games. Michael was the DH in 8 games. Michael played in 72 complete games. April 8: late scratch with lower back stiffness. he reached for something and it grabbed at him. currently day-to-day. April 9: still out with lower back stiffness, team being cautious. he will be examined and have an MRI in Cleveland on April 10. April 11: out again with lower back strain and could be out a couple games. he experienced lower back spasms late in the game on April 10 and Francona admitted he should have sat him another day. no one thinks a DL stint is necessary. April 12: back feeling slightly better. hope is he'll play April 14. April 14: went through full pregame workout. possible return April 15, but the team is really aiming for April 17. saw specialists beyond team doctors and they don't think the issue will linger. April 15: hit in batting cage and did work in the outfield before the game. should be in starting lineup on April 17. May 23: not in lineup. June 3: not in lineup. June 7: not in lineup. June 15: game postponed, to be made up August 24. June 27: game postponed, to be made up June 28 in a day-night DH. because the Indians have played 88 of 162 games to this point--not technically "half" but that is what it is--Michael has up to 74 games left this season to build up his numbers after the break. here's hoping he can put together a strong 2nd half and heavily increase his stats. go Michael! and good luck!